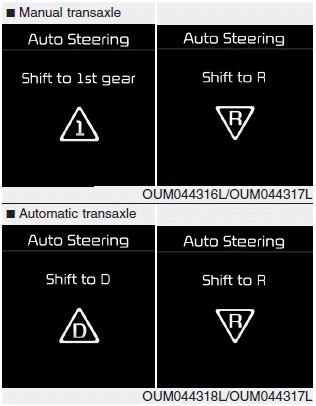 The above message will appear if the shift lever is in R (Reverse). 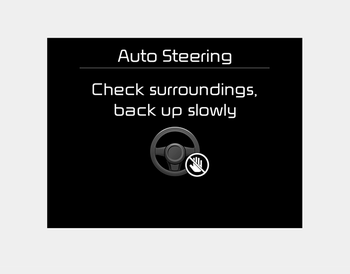 The steering wheel will be controlled automatically. The system will be cancelled if vehicle speed is over 7km/h(4.3mph). Always check for objects around your vehicle before driving. If the vehicle does not move even though the brake pedal is not depressed, check the surrounding before depressing the accelerator pedal. Be sure not to speed over 7km/h(4.3mph). If you do not follow the instructions provided, you may fail to park your vehicle. However, if the Parking Assist System warning sound (distance from object is within 30cm: continuous beep) occurs, slowly drive the vehicle to the reverse direction of the detected object after checking the surrounding. Always check the surrounding before driving your vehicle if the Parking Assist System warning sound (distance from object is within 30cm: continuous beep) is heard for the object is close to your vehicle. Press the Smart Parking Assist System button or turn the steering wheel to the left or right. When the above message appears with a beep sound, shift the gear and drive the vehicle with the brake pedal depressed. Always check the surrounding before releasing the brake pedal. Always be careful while parking for other vehicles or pedestrians.